The tortoise model is now ready for you to download. Exclusive to you, dear subscriber, the tortoise model uses a lever and slider to peep out of her shell. The model comes as a single file containing both fully coloured and mono parts – you choose which you print out. 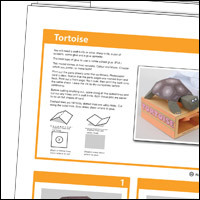 Follow the fully illustrated instructions to make your own animated tortoise model. If you're not a subscriber yet… what are you thinking!? You can sign up here. 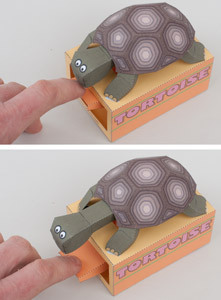 ← Tortoise model. In colour!